Unfortunately, termites aren't the pickiest of eaters. To them, our homes are just so many dead trees; and to a termite, wood is wood. They're just as happy eating a house as they are eating some dead old tree in the forest. Left untreated, termites can literally destroy a wooden home as they systematically consume it. 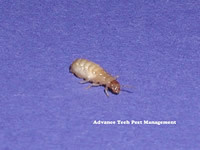 That's why at Advance Tech Pest Management we offer several highly-effective termite control methods. For the story of one particularly interesting termite job we did, please click here. 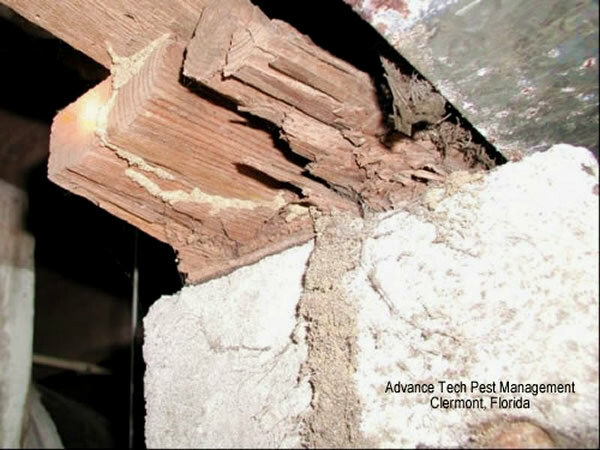 Termites damage wood by literally eating it. Bacteria that live in the termites' digestive systems enable them to digest the cellulose in wood (the part of the wood that makes it rigid). That makes termites unique in the animal kingdom: They are the only known insects who actually derive nutritional benefit from the cellulose portion of wood. Because subterranean termites require a very high moisture level and will die if they are exposed to sunlight or air currents for very long, they must stay in constant close contact with the soil. When the wood that termites are eating is separated from the soil, whether by a few inches or a few feet, termites build mud tubes (like the ones shown in the picture on the right) between the soil and the wood. These tubes are like humidity-controlled tunnels that enable them to move back and forth between the soil and the wood without dehydrating or exposing themselves to sunlight or air currents. If the mud tubes are broken, worker termites will immediately race to rebuild them; and in larger colonies, soldier termites will gather at the break to ward off ants and other predators. The presence of active mud tubing is evidence of an active termite infestation that needs to be treated before more damage is done. Unfortunately, because the mud tubes can look very much like mortar, many homeowners overlook them, never realizing that their houses are being eaten away right under their noses. If the wood that termites are feeding upon is in the soil or is directly touching it, then mud tubes are unnecessary. The termites will just travel between the soil and the wood. In cases like this, there usually will be little evidence of a termite infestation that an average homeowner would notice until the colony is mature and alates (or "swarmers," shown in the picture on the right) appear. 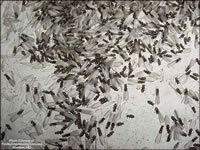 Swarmers are mature reproductive termites who are leaving the colony to establish a new one of their own. It's pretty romantic, actually, especially since for most of them, their attempt will end tragically. 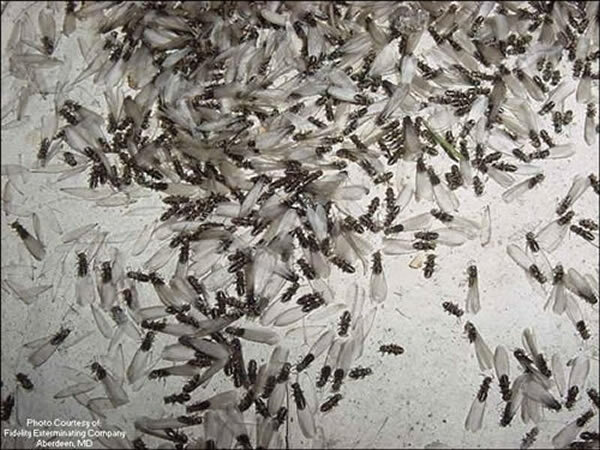 The vast majority of swarmers will not succeed in a new colony, but will die -- their dead bodies and shed wings along door and window frames often being the first visible sign to the a homeowner that their house has a termite problem. Unfortunately, by the time swarmers appear, the colony is already mature. It's been there for at least a few years, and it's likely that quite a bit of termite damage already has occurred. That's why routine inspections by a termite control professional (like us, for example) are vital. If you have any reason to believe that you may have a termite problem (or even if you don't, but just want to be careful), contact us for a prompt, professional termite inspection. There are three options available for the control of subterranean termites. The first option, direct wood treatment, usually is applied while a home is being built, but sometimes is appropriate for existing homes. The two remaining options, liquid treatment and termite baiting, are the most commonly used termite control methods for termite infestations in existing structures. The fastest and most direct way to treat subterranean termite problems is using a liquid treatment injected directly into the soil around the home. Our product of choice for liquid treatment is Termidor, a state-of-the-art, non-repellent termiticide that has been proven effective in eliminating every termite infestation, in every test it's been subjected to, for almost two decades. Termidor doesn't create a "chemical barrier" like older, repellent termiticides. 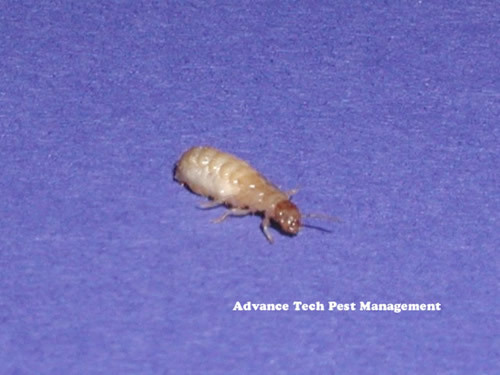 In fact, termites forage freely through Termidor-treated soil as if the chemical wasn't even there, and they transfer the termiticide to other members of the colony in the course of their normal grooming, feeding, and other activities. As a result, the entire colony eventually is eliminated. After the initial treatment, the property is inspected annually to make sure that the treatment hasn't been compromised and is still providing protection. Termite baiting is a slower approach to termite treatment, but it is preferred by people who are uncomfortable with liquid treatments. Baiting can also be used in situations that would make liquid treatments impossible or inadvisable, such as on properties with very high water tables or where drilling or trenching would be impractical. Once the colony is eliminated, the stations are periodically inspected to make sure that no new colonies have become active. Which Termite Treatment System is Right for My House?